Quick Take: What this lacks in complexity, and it is definitely lacking, it makes up for in lightness and drinkability. This is a well-blended beer that integrates the bourbon to enhance the base beer without overrunning it. Just temper your expectations, especially if your reference point for dark and delicious Firestone beers is the rich, boozy and complex Parabola. Brew Facts: Velvet Merkin, a barrel-aged version of Firestone’s Velvet Merlin, was originally created as a component for Firestone’s ever-changing but consistently fantastic Anniversary Ale. Not long after, Merkin became a standalone beer in its own right that is available in bottle and draft. This is similar to how Double DBA and Parabola were created. Appearance: I was given a Deschutes Not the Stoic by accident at first and was thrown off by the copper red color of it. A quick heads up to the bartender got the situation sorted, but that is an odd mistake to make (He thought he gave me Velvet Merkin). Regardless, Merkin is dark. Mahognony brown dark and no light is going to penetrate its depths any time soon. A foamy tan head with thin white ring on the top formed on the initial pour, but at 5 oz, there wasn’t much room for it. It settled quickly to a tan ringlet of foam with a crescent moon gap of black. Aroma: The surface area is so small, it’s difficult to get a handle on the aroma. I get wood (in public no less), bourbon alcohol, some grain/oat, raisin and coffee. The slightest bit of vanilla, but it’s probably wishful thinking. I’ll admit this is not the best situation to fully appreciate the nose, but it really seems like a mild beer from what I can tell. Taste/Mouth Feel: Nice medium mouth feel that thins out a little too much on the finish. There is the slightest bit of carbonation, which works with the lighter coffee/espresso qualities. Oat adds some weight to the body. The main flavors are roast and raisin. Hits some chocolate notes on its way to a vanilla/brown sugar and plum finish. The bourbon is present, adding some dark sugar and slick/buttery layers to the base oatmeal stout. Dry roast and raisin on the finish lingers. A ghostly, warming alcohol presence hangs round in the throat. It’s there but in a non-corporeal way. Yes, I’m saying the alcohol from this beer is haunting my throat. Final Thoughts: What this lacks in complexity, and it is definitely lacking, it makes up for in lightness and drinkability. This is a well-blended beer that integrates the bourbon to enhance the base beer without overrunning it. 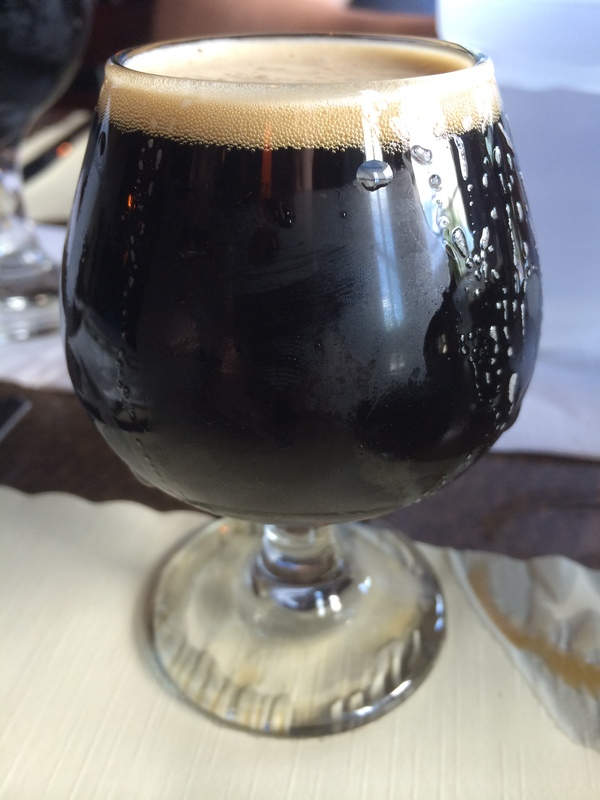 Velvet Merkin allows the oatmeal stout qualities to exist, but with a warm, bourbony edge. The only real fault here may be that while Velvet Merlin is a fine oatmeal stout, it’s unremarkable. Merkin takes a decent beer and barrel-ages just a bit of depth into it, which might be enough if you don’t want to be floored by bourbon and heavy stout flavors. Just temper your expectations, especially if your reference point for dark and delicious Firestone beers is the rich, boozy and complex Parabola.